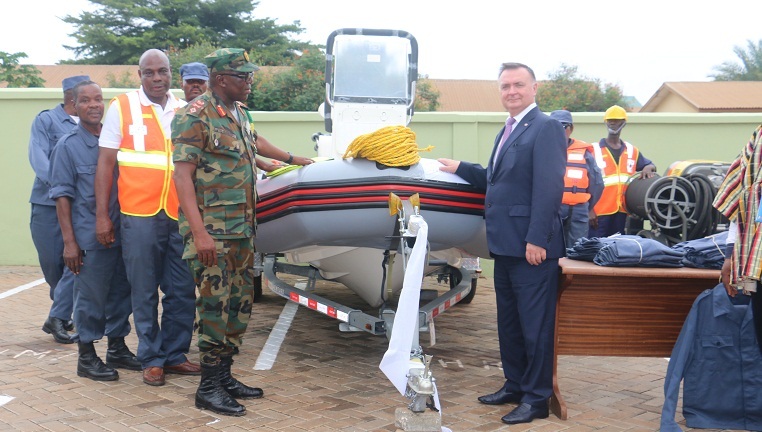 The International Civic Defence Organisation (ICDO) has presented disaster relief items to the National Disaster Management Organisation (NADMO). The items included four compressors and transport trolley, two motor pumps and its accessories, two jack hammers, 350 rescue jackets, 150 rescue trousers and 350 caps. The gesture formed part of ICDO’s protection and development programme, which also focused on training, technical assistance, audit and humanitarian services to the community. Brigadier General Francis Vib Sanziri, the National Co-ordinator of NADMO, who received the items, said his outfit would coordinate with development institutions such as ICDO in disaster management. Brigadier Sanziri thanked ICDO for the gesture, adding that the equipment would be used for the purposes for which they were donated. The Minister of the Interior, Mr. Prosper Douglas Bani, who was represented by Mrs. Adeliade Annor – Kumi, the Chief Director of the Ministry of Defence said the donation would help NADMO to improve on its activities. Dr Vladimir Kuvshinor, Secretary General of ICDO, urged government to provide adequate protection for the people against disaster. He commended NADMO for its efforts but acknowledged “the challenge today is bigger than ever before”. He said ICDO would continue to support Ghana and other Economic Community of West Africa States to tackle natural and human disasters.